Queensland industries, enterprises, individuals and regions all experience industry transition, a continual event in an industry’s lifecycle. Depending on their speed, magnitude and severity, industry transitions can have a variety of economic and social impacts on enterprises and their workforce in regions and communities. The impact of industry transitions can be challenging, however industry transition can also be experienced positively by enterprises and individuals in situations where an industry grows rapidly or where there is industry renewal. Jobs Queensland has delivered the Supporting workforces during industry transition: Key elements for success project to better understand the impacts of and strategies needed to support the workforce in industries undergoing transition. The Supporting workforces during industry transition: Key elements for success literature review. The literature review identified eight key elements for success to support workforce during industry transition, as well as the need for ongoing evaluation and learning from experiences to inform future strategies. 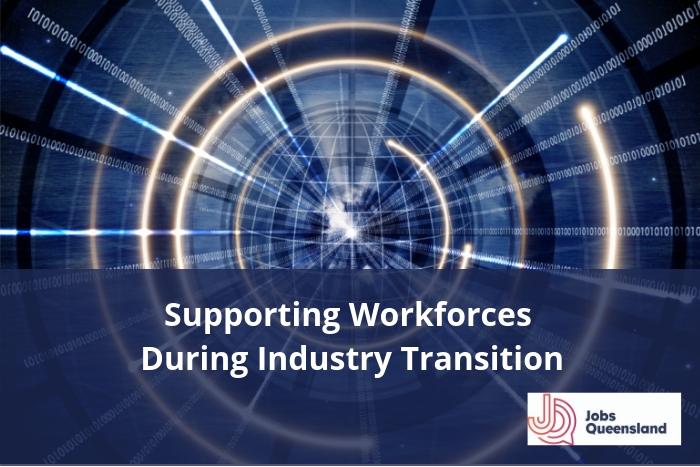 The Supporting workforces during industry transition: Key elements for success report. The key elements for success identified within the report provide guidance on how to best respond to future industry transitions and promote positive long-term outcomes for those affected. Click here to download the report and literature review.